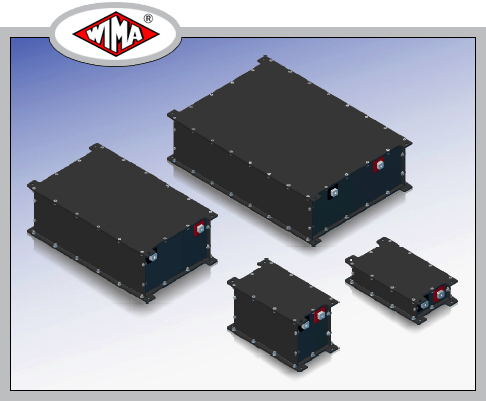 The WIMA PowerBlock range has a modular design.The configurations displayed are representative examples which at any time con be adopted in terms of capacitance,voltage or dimensions. Customized solutions can be realized on request. WIMA PowerBlock modules stores energy and releases it within short time in e.g. • Railway technology e.g locomotives, electric tramway etc. • Hybrid and heavy transportation in e.g. construction, agricultural and forestry machines,city busses,fork­ lifts,cranes etc. • Automated guided vehicles (AGV) in production facilities,in-plant logistic systems etc. • Uninterruptible power supply (UPS) in hospitals, telecommunication systems,oil and gas extraction etc. • Wind power systems e.g. in pitch control. • Very fast recharge of the PowerBiock. The use of PowerBiocks as energy storage increases efficiency and life time of the applications,saves weight and cost for maintenance,and is environmentally friendly.